The opening of the world’s first hypercoaster, Magnum XL-200, back in 1989 at Cedar Point in Sandusky, Ohio, spawned the construction of dozens of roller coasters reaching for the stratosphere. Today, it’s fairly common to find at least one hypercoaster at any of the major amusement parks – in some cases two or more! So, which hypercoasters are the best in the United States? Here are 5 of the best hypercoasters in the United States – though you may have your own idea as to which 5 deserve the top ranking. A steel roller coaster which opened at Kings Dominion in 2010, Intimidator 305 reaches an astonishing 305 feet high and plunges riders nearly straight to the ground at 90 miles per hour. Holding the record as the tallest and fastest roller coaster on the East coast, Intimidator 305 is located in Doswell, Virginia. This hypercoaster is themed after legendary NASCAR driver Dale Earnhardt, who ruled the racing tracks for much of his career until his tragic death on the last turn of the last lap at the 2001 Daytona 500. At one point in the ride, guests experience nearly 6Gs of force and hit several moments of airtime before coasting back into the station. Featuring a 225-foot drop and a top speed of 80 miles per hour, Desperado was among the tallest roller coasters in the world when it opened at Buffalo Bill’s Hotel and Casino in Primm, Nevada, back in 1994. Today, Desperado still whitens the knuckles of riders who hop on the saddles of this bucking bronco, which exerts forces of nearly 4Gs and takes riders through a portion of the casino’s interior. In a bit of interesting trivia, Desperado was officially dubbed the world’s tallest rollercoaster by the Guinness Book of World Records in 1996 (this record is now held by Kingda Ka, the 456-foot-tall hydraulic launch rollercoaster that dominates the sky over Six Flags in New Jersey). In 1999, Busch Gardens in Williamsburg, Virginia, debuted Apollo’s Chariot, an out-and-back hypercoaster that quickly became a favorite rollercoaster for many enthusiasts. While the lift hill is 170 feet tall, part of the 210-foot drop plunges into a ravine. The ride sends guests at speeds of 73 miles per hour over a series of airtime hills and through a massive helix before coasting back to the station at the end of 5,000-foot track. Rising high above a famous spit of land in Sandusky, Ohio, is Millennium Force, a 310-foot-tall behemoth of a roller coaster that dominates much of Cedar Point. Built by Intamin in 2000, Millennium Force features several airtime hills, overbanked turns, a top speed of more than 90 miles per hour, and a length of more than 6,500 feet. 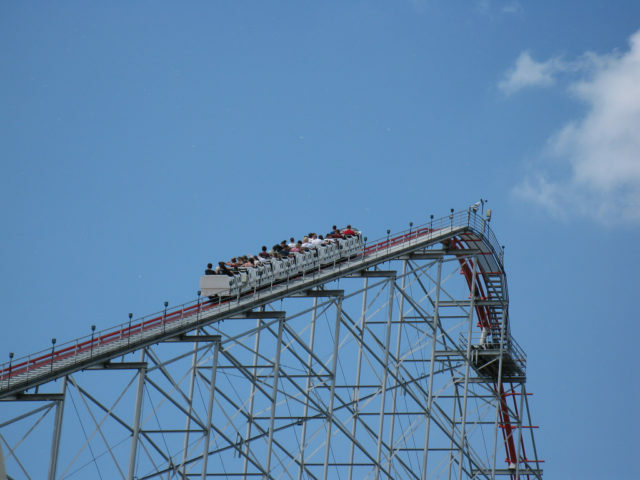 At the time the ride opened, Millennium Force smashed several world records, including being the tallest and fastest complete circuit steel roller coaster. The world’s first hypercoaster still ranks as one of the best. Magnum XL-200 crests riders 205 feet above the banks of Lake Erie before plunging them to the earth at speeds of more than 70 miles per hour. Along the nearly mile-long track, riders experience several instances of airtime and descend into the dark depths of a tunnel before coasting back to the station. Though somewhat dwarfed today by Cedar Point siblings Millennium Force and Top Thrill Dragster, Magnum XL-200 is a classic roller coaster that continues to thrill ride enthusiasts young and old alike. As for the numerous other hypercoasters that rise above the amusement parks of America, they, too, provide an experience that riders won’t soon forget. And, while this tour of hypercoasters is nowhere near exhaustive, many roller coaster enthusiasts, including those who favor wood roller coasters, would agree that these 5 rides represent a quarter century of the roller coaster industry’s finest technology, best engineering, and greatest innovation.